Profit taking drags markets down. The stock markets closed down as the investors seen booking profits amid consolidation on Tuesday. Mumbai: The stock markets closed down as the investors seen booking profits amid consolidation on Tuesday. The oil, metals and select bank stocks dragged the markets lower, while weak opening of European markets also dampened the investor sentiment. However, the select auto and IT shares counters get buying demand restricted the market fall to some extent, says the analysts. The experts feel the markets may move upside only if companies announce improved earnings in the next few weeks. 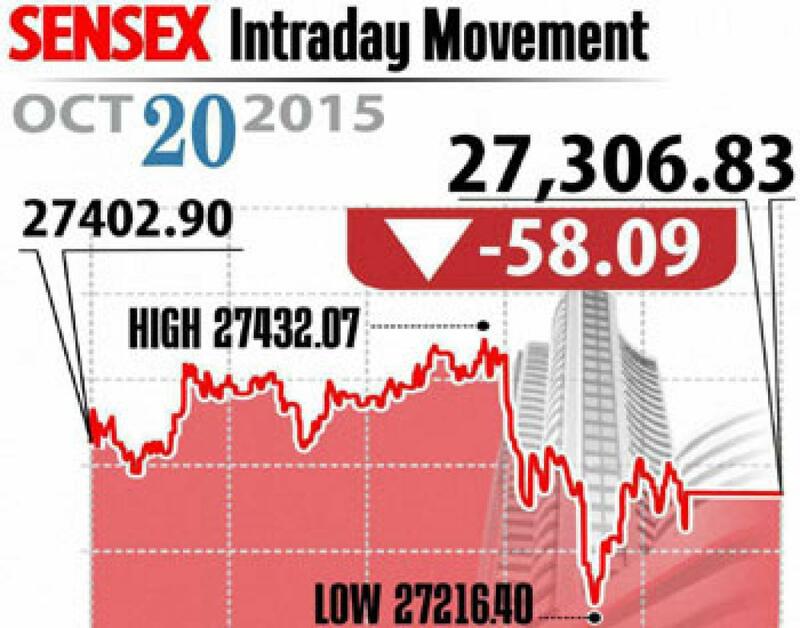 Sensex closed lower by 58 points at 27,306 and Nifty ended 13 points lower at 8,261. However, broader markets outperformed over index shares with midcap and smallcap indices closed marginally positive of 0.5 per cent and 0.2 per cent, respectively. On the sectoral front, the sectors like metal, realty and IT indices down between 0.6 to 1.5 per cent, while power, IT and consumer durables indices up 0.6 per cent to 1.4 per cent. The heavyweights Vedanta, Cipla, M&M, Hindalco, Bajaj Auto, ONGC and Coal India reported loses. While drug major Cipla fell over 2 per cent, on the other, the IT major Infoys, TCS and Maruti up over 2 per cent. The gainers: Tata Consultancy Services (TCS), up 1.60 per cent at Rs 2,526.70; Tata Motors, up 1.19 per cent at Rs 383; Infosys, up 1.18 per cent at Rs 1,125.35; Maruti Suzuki, up 1.13 per cent at Rs 4,510.65 and Axis Bank, up 0.39 per cent at Rs 508.70. The losers: Vedanta, down 6.42 per cent at Rs 101.25; Tata Steel, down 2.96 per cent at Rs 240.80; Hindalco Industries, down 2.37 per cent at Rs 84.40; Mahindra and Mahindra (M&M), down 2.23 per cent at Rs 1,250.95; and Cipla, down 2.13 per cent at Rs 672.45.